I guess that clears up that situation and hopefully with two weeks of rest, he will be ready for Penn State. Michigan Basketball also got an important 2020 commit yesterday. 4 Star PG from OH Zeb Jackson committed to the Wolverines. Zeb is 6'3 and known as a shooter, he is tight with Zavier Simpson and his family. Rivals has him ranked as the #72 player in the nation and 24/7 has him ranked #58. Both services have him ranked as a top 20 PG. Why did this information come from his mom? Where are the coaches or Gary himself to inform us of this information? This is a bad look in my opinion. 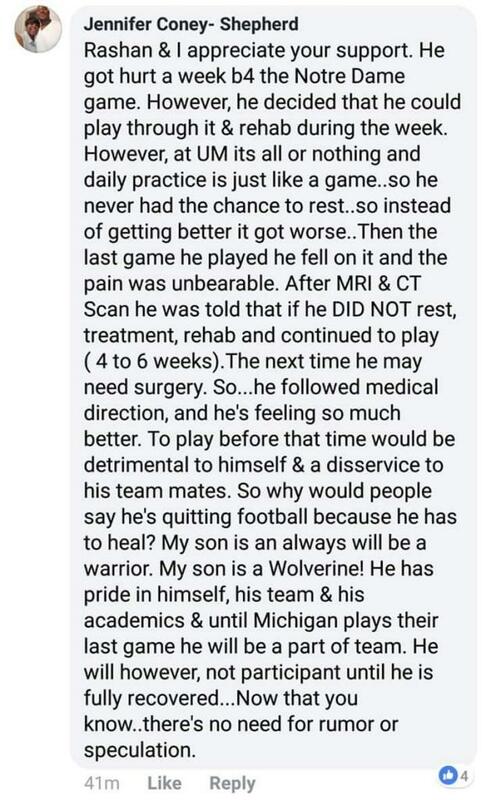 His mother will not be able to fight these battles in the NFL. Love Gary but whoever is advising him needs to do a better job. Perhaps she is the one that knows what is going on? Rashan and his mom are pretty tight. I don't think it is his mommy coming to the rescue or anything like that. Besides, does anyone really think that you would get this kind of information out of Jimmy?